During pregnancy there is a very good chance that we are able to influence the spiritual growth and the intelligence of our babies. It is also good to know that we can help them form an opinion about their lives. The beauty of the world they live in during the 9 months of pregnancy is that part when we choose to treat them like the best thing that ever happened to us and by this integrate them in our daily routine. I have read in so many magazines for mothers about the wonderful step a mother can make starting the education of her baby from the very moment he or she is conceived. I used to think that this is something out of a science fiction book and even though I am a strong follower of the concept that the bond between the mother and her baby is unbreakable and goes on long years after the birth, this idea of starting an education this early seemed a bit too much. She liked environmental music a lot and I remember she was all the time with her iPhone headphones in her ears listening to it. I used to say to her she will make the baby’s brains go mush after so much environmental noise but she made fun of me and went one with it. Funny is that her pregnancy went smoothly without any problems, the little one kicking on schedule and behaving very nicely with her mom. I remember that during my own pregnancy time both of my kids were pretty restless and there were nights when I couldn’t sleep because of their” football game”. Well…my god daughter was very good. Her mom got all the rest she needed and was feeling wonderful. She was a single mom, and she was dreading the fear of the birth moment. But the little girl surprised her. She came into the world a week earlier while her mother and I were shopping and the birth went as smooth as a birth can go. When I first saw this little bundle in the arms of her mom I was so glad to see them both radiant that I almost cry. 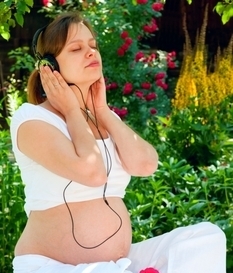 Ever since then the little girl and her mother are exactly as they were during the pregnancy, best friends, enjoying life, smiling and listening to environmental music. There is something about the pregnancy that makes us think we are facing 9 months of burden and maybe most of us are. What does happen to those mothers that go through this period with a smile on their face, acting like they have the time of their life? They really enjoy being pregnant and their children are sure to enjoy life.